Courtesy photo Daredevil Nik Wallenda walks on a “tightrope” cable across Niagara Falls last summer. The cable was designed by Power Engineers, based in Hailey. Renowned tightrope walker Nik Wallenda will speak to a group of engineers at a power line conference on Wednesday, March 6, in Sun Valley. The event is restricted to conference participants. The seventh-generation daredevil has reason to thank personnel at Power Engineers in Hailey for keeping him safely above Niagara Falls during a tightrope walking feat last summer. Power Engineers was called upon to help design a 2,350-foot-long cable, 2 inches in diameter, for Wallenda’s walk 200 feet above Niagara Falls between the United States and Canada. “We engineered it with help from Nik’s uncle Mike Troffer, who has an engineering background,” said Power Engineers project manager Peter Catchpole. Wallenda has plans to use Power Engineers’ designers to stretch a cable this summer across a portion of the Grand Canyon. He plans to walk on the cable on June 23, 1,400 feet above the canyon floor. After working with Wallenda at Niagara Falls, Catchpole invited him to be the keynote speaker at Power Engineers’ 23rd annual power line conference,. “It will be inspiring, but also entertaining,” Catchpole said. 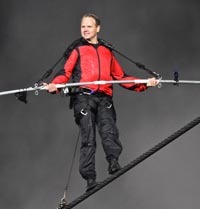 Wallenda holds seven world records, including the longest ride on a wire on a bicycle. He has also walked on a moving Ferris Wheel and hung from his teeth 250 feet above the ground under a helicopter. Catchpole previously worked for Power Engineers on a 4,000-foot-long high-voltage power line across a deep ravine at Kildala Pass in British Columbia.